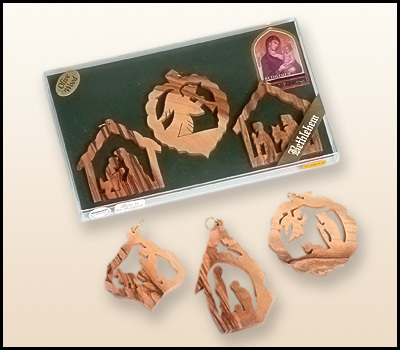 Hanging Olive wood Christmas Ornaments set of 6, Included certificate of origin, Size: Length-11cm Width-18cm The sets come with different model from all the hanging christmas ornaments model. (write the cat No. in the comments place). * For regular mail (registered) Please allow up to 21 days for Item arrival usually it takes less than 14 days. * You can alwayes choose the EXPRESS MAIL (2-4 days) for the best quick mail service. * Best Price Product. Best Quality. Unique and exquisite design. * We are proud to have an unconditional, 'no hassle-no questions asked' 14-day money back guarantee. Read our excellent return police. * Orders are carefully picked & packed. Check our great gift wrap option.